Prahalad - the son of Hiranyakasyap - had absolute faith in God; there was not even an iota of doubt in his mind that the Parabrahma exists and exists everywhere. He believed that the very existence of the universe is an act of the God - whereas his father believed otherwise. When challenged by Hiranyakasyap to prove the existence of Parabrahma, Prahlad said that the God exists in every atom and even in subatomic particles. On hearing this Hiranyakasyap retorts and asks Prahlad as to whether the God is in the pillar nearby. Prahlad replies that the God is not only in the pillar but also in the very words uttered by Hiranyakasyap and also in the sound of those words. Angered by this and with a view to proving Prahlad wrong Hiranyakasyap hits the pillar with his mace so as to break it. Lord Vishnu takes the form of Narasimha ie. Half in the form of Nara [man] and half in the form of Simha [Lion] and comes out of the pillar and kills Hiranyakasyap - the Rakshas. The Narasimha avtar of Vishnu is in a ugra [angered] form as it was taken to avenge the sufferings of true and faithful followers of the God at the hands of Hiranyakasyap [representing the evil forces]. Therefore, to worship Narasimha is to worship the destroyer of evil forces. Since Narasimha is in a ugra form it was considered appropriate that he be worshipped in his Santha [mellowed] swaroopa by common mortals. 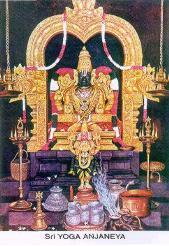 Lord Narasimha is santha swaroopi when Laksmi is with him [he is then known as Lakshminarasimha] . He is also in his santha swaroopa when in Yoga form -he is then called Yoganarasimha. He is in this Yoga form at Solingar - a corrupted version of the correct name Sozhasingapuram - a place about thirty KMs from Tiruttani in TamilNadu. This place was originally known by the name Kadikachalam, since it was believed that if a person meditates for one "Kadikai" [meaning one Nazhigai - a unit of time approximately equal to 24 minutes] at this abode of Lord Narasimha he is sure to attain Mukthi. The temple for the Lord is situated on the top of a hillock. The hillock is 400 feet tall. The main entrance to the temple is North facing. The Lord faces East and with his benign looks blesses all those who go there with devotion and faith. 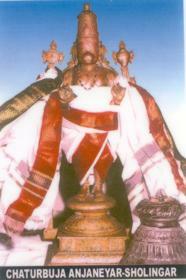 His consort here is known by the name Amirthavalli Thayar. After getting down from this hillock and walking some distance there is another hillock - much shorter than the earlier described. It is about half the height of the other hillock . There is a temple on the top of this hillock, for Yoga Anjaneya. The main entrance to this temple is also North facing. The entrance to the main shrine of lord Yoga Anjaneya is west facing. Lord Anjaneya in his Yoga posture is facing west - facing Lord Yoga Narasimha in the other hillock. Another specialty of Yoga Anjaneya is that he has four hands., Chaturbuja roopa. He wears the Chanku [conch] and the Chakra [wheel -Sudershana] said to have been given by Lord Yoga Narasimha himself. Through the hole in the wall opposite to the Yoga Anjaneys’s sannidhi, one can see the temple Gopuram of Lord Yoga Narasimha. The temple tank [pushkarani] is known as Hanumantha Thirtham. While there are temples at other places for Yoga Narasimha, Solingar is the only place where Lord Anjaneya can be seen in Yoga posture. He is not only a Yoga Moorthi but also the Moorthi who established Ahimsa Dharma. Madurai was then ruled by King Indirathuman and he was fond of hunting. One day he chased a deer till the deer entered the forest in Sozhasingapuram. When the deer reached the hillock where presently Yoga Anjaneya’s temple is situated, it turned into a Jothiswaroop and vanished. On seeing this wonder the King prostrated before the Jyothi and then and there took the path of Ahimsa. With Ahimsa as his weapon he could bring down the evil force - Kumbotharan - and brought peace to the people of Sozhasingapuram. It is said that as per the wish of Lord Yoga Narasimha, Lord Anjaneya appeared in the form of Jothi with a view to taking King Indrathuman to the path of Ahimsa. Neither of the Lords - Yoga Narasimha or Yoga Anjaneya – have Uthsavamoorthis. All the uthsavas are performed in Lord Bhaktavatchalam temple - in the centre of the town Solingar - which is nearly two KMs from the hillocks. This temple has been built during the regime of Nayakas and is very spacious. It has big Prakaras and tall Mantaps. Lord Yoga Anjaneya is believed to cure persons who are mentally ill, if they pray at this temple. All that the patient is required to do is to take bath in the sacred Hanumantha Thirtham and offer prayers to Lord Yoga Anjaneya. To believe this, one has to see for himself the miraculous cure that the mentally ill gets at this shrine. Location of the temple : "Yoga Anjaneya Swami Temple, Sholinghur"